Round two of the 2019 Putting Tour took place yesterday at The Range Warkworth. 17 players battled against each other, the fun yet demanding course and the very very hot conditions. It was the first event held in Warkworth and most players enjoyed the new course. The par for the course is 36 and James McCarthy lead after round one with a very consistent 34 (-2). Hole 6 proved tough and you had to time your shot to get through the trap door. Round 2 saw a number of aces and some good scores starting to come through. Darren Prole shot an outstanding 33 (-3) and playing partner Matt Ansley managed to go one better with a 32 (-4) and set a new course record. As the sun continued to beat down, mistakes were becoming frequent but the enjoyment level stayed high. John Ansley decided to start playing to his potential and in the third round matched his son's 32 to jointly hold the course record. Heading into the fourth and final round Matt Ansley was on 102 (-6), James McCarthy was 108, Darren Prole and Jacques van Zyl were tied on 109 and John Ansley was on 110. The final round saw a few nervous strokes and some unplanned high scores. The sun continued to beat down. Final results finished with Matt Ansley on 135 (-9), Jacques van Zyl 144, James McCarthy 146, John Ansley 147 and Darren Prole 149. All results are already up on our website. 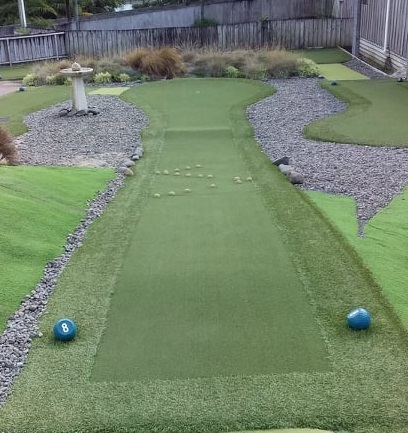 Round three of the 2019 Putting Tour takes place on April 13th at Kiwiana Leisure Park in Otorohanga. We can't wait!! Article and photo courtesy of the New Zealand Minigolf Federation. You can see the article from Round 1 here.